Memorial graveside services will be conducted Saturday, December 9, 2017 at 1:00 p.m.at the Dickson Union Cemetery with Bro. Rufus Clifford officiating. Place of rest will be in the Dickson Union Cemetery. Mrs. Suggs, age 88, of Cumberland Furnace, TN died at her home November 8, 2017 after a short illness. She was born in Cumberland Furnace, TN daughter of the late William Richard and Edna Mae Gafford Hayes. She was preceded in death by her husband Shelton Suggs and a loving mother to Richard Suggs. She was an incredibly fun loving beautiful grandma to Jeanell Suggs-Munoz and great granddaugher Harlow Sky Munoz. The many that loved her were her sister in law Mrs. Edyth Hayes, best friend Shirley Hafner. The ones who brought much love and joy to her also included her nephews Marcus Hayes and Troy Mills. She loved attending her beloved Central Church of Christ in Charlotte,TN. She kept many friends from there and the surrounding community. There was no one whe met her who didn't love her. 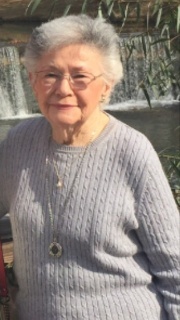 She loved her family, friends and community dearly as well as her church, baking, long drives in the country and antiquing with her granddaughter Jeanell. Mrs. Suggs was a homemaker and a retired bank teller.